This is a thai style kerabu - deboned chicken feet with mango and carrot strips with lots of onion rings and bird eye's chillies and seasoned with lime juice and sugar . 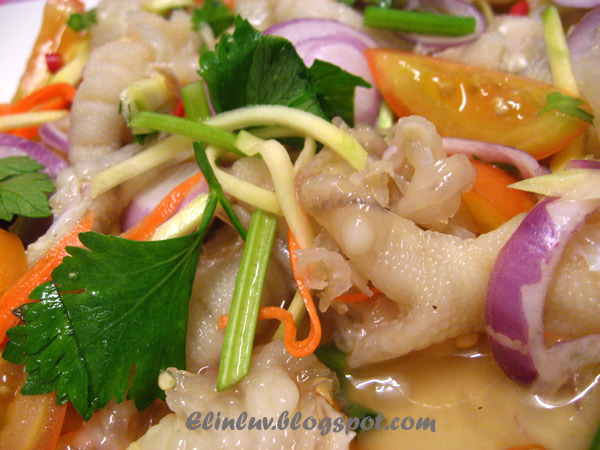 The chicken feet are crunchy and springy at the same time....a delicacy in Thailand but it is also a delicacy in Malaysia. I bought this from a stall in the hawker center near Tesco Ipoh. 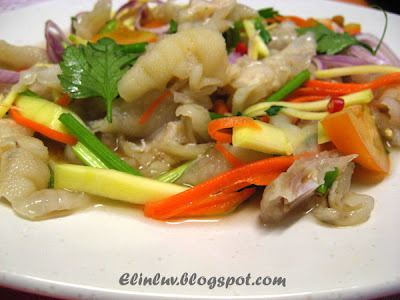 I wish I know how to debone the chicken feet :) Truly appetizing and this is a light appetizer . When I am lazy to make my own salad...this will do :p This is prepared by a Thai lady in her sixties and she makes hot and spicy Tom Yam Kung too and they taste just as good. Now I know where to get my Thai food when I crave for it. speaking it is not pleasant for the eyes but it is tasty for the palate! What about you.....adventurous enough to try this out ???? Amazing dish. Love the flavor profile. Thank you for sharing. I like this. They serve it in some chicken rice stalls in Singapore. I didn't like this until I took a couple of bites...and it's really good! Surprising :-) and Appetizing too! this look so tasty + refreshing! i do enjoy chicken feet but only made in soup for the silky stock and then .....dipped in soy with white pepper!